Geographical variation: Two subspecies recognised, with the nominate form frugilegus from Europe introduced to New Zealand. The only member of the crow family found in New Zealand in modern times, rooks were introduced by Acclimatisation Societies in 1862-74. Liberations in the Nelson and Auckland areas and failed, but after a slow start, populations in Hawke’s Bay and Canterbury flourished and spread. The rook’s diet is a mixture of invertebrates and vegetable and the rook is often vilified by farmers for its crop destruction. Others have accepted this intelligent bird as a welcome addition to our sparse large bird fauna. 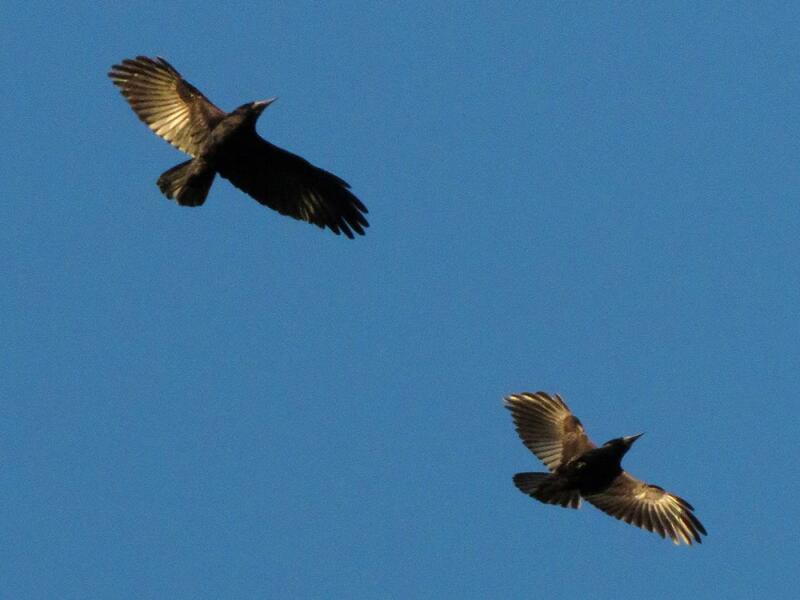 Rooks are almost entirely black with a purplish gloss. The face is bare light grey skin, the beak is long, pointed and black, and the eye is dark brown. When walking on the ground they have the appearance of baggy-trouser like feathers on the upper leg. 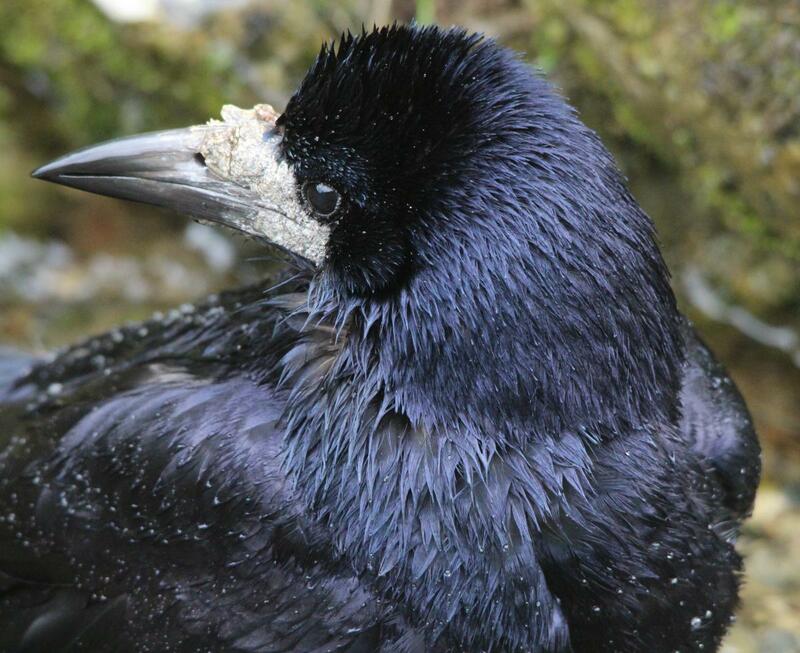 Juvenile rooks have feathered faces. With steady wing beat in the air, the rook creates a short-necked silhouette, like a black cloth being towed through the sky. Voice: usually a repeated caw, kaah, kroh, gag, and sometimes kiu. Similar species: there are no other crow species confirmed to occur in New Zealand, although a possible Australian raven was reported from Mokohinau and Little Barrier Islands in October 1945, and other Australian crow species could occur as vagrants. 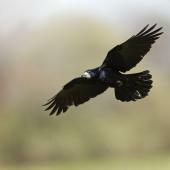 The Australian raven is larger than a rook, has a feathered face and long pointed ‘hackle’ feathers under the chin. 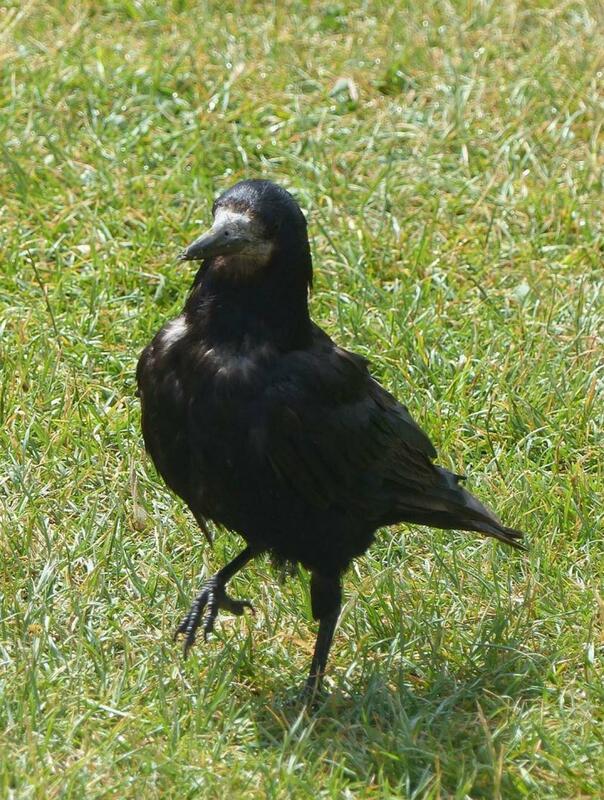 All five Australian crow species are larger than the rook, have feathered faces, white eyes, and lack the ‘baggy-trouser’ look, and are mainly distinguished from each other by their calls. Single, silent, vagrant birds would be very difficult to identify to species. Poisoning of nests by regional councils has eliminated the large rookeries that were common in the arable farmland and in hill country of Hawke’s Bay and Canterbury. The populations now consist of scattered individuals across a wide geographical range. In the North Island they are known to exist or have existed in Miranda (Firth of Thames), Tolaga (north of Gisborne), Waitotara (Taranaki), southern Waikato, Manawatu (from Palmerston North to Cheltenham), and Taihape as well as their strong hold of Hawke’s Bay and northern Wairarapa. 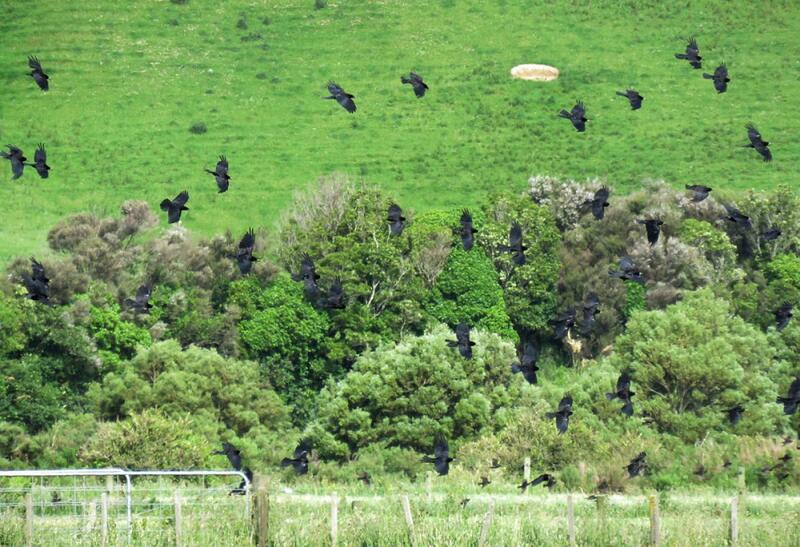 Rooks in Canterbury have spread less but have been found in Middlemarch (North Otago). 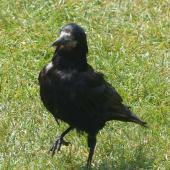 It has been claimed that rooks are now extinct in Canterbury. Juveniles have been seen in Northland, Wellington, Southland, and on Chatham and Stewart Islands. 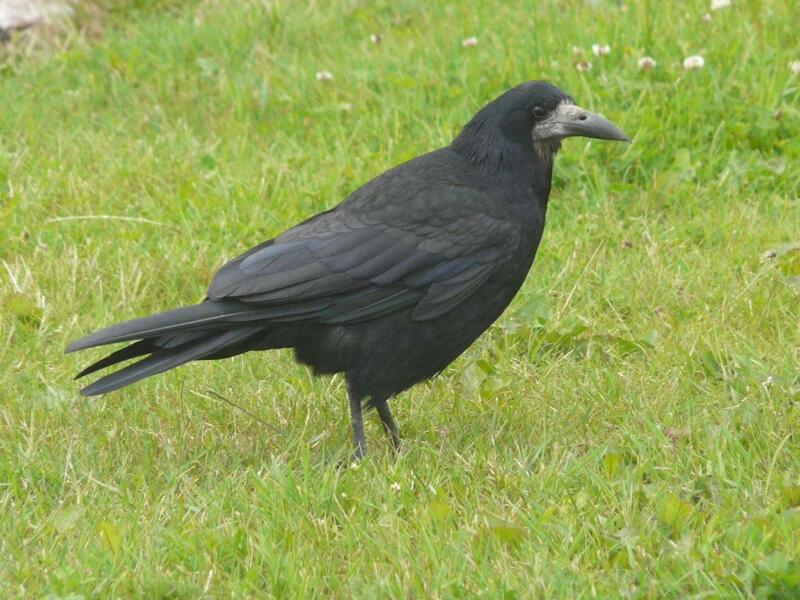 Rooks are found throughout Europe and Asia. 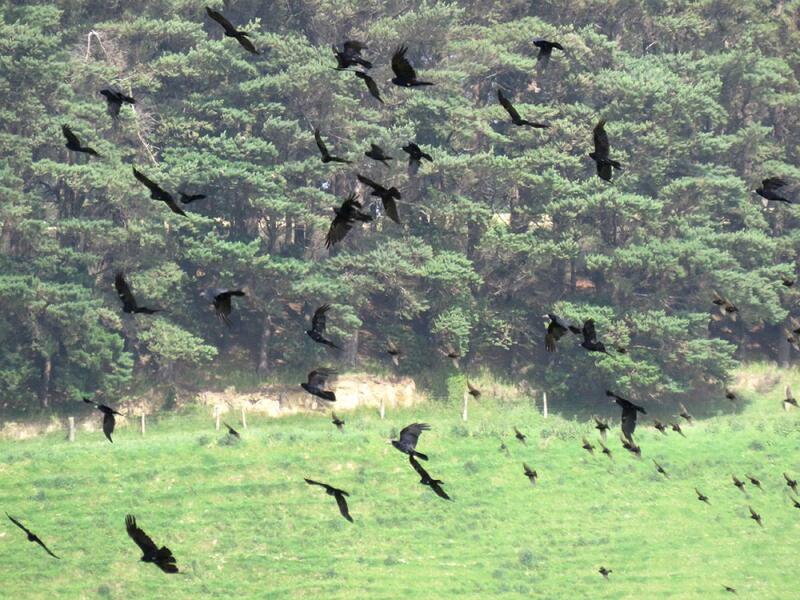 It was estimated that there were about 30,000 rooks (25,000 in Hawke’s Bay and about 2,500 in Canterbury) before control was started in the 1970s. 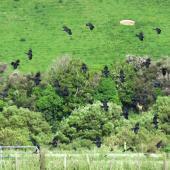 The number of rooks killed in Hawke’s Bay between 1971 and 1985 totalled about 50,000 birds. The population now-a-days is not known due the nomadic nature of the remaining rooks, but the Hawke’s Bay Regional destroyed 700 nests between Wairoa and southern Hawke’s Bay in 2012. 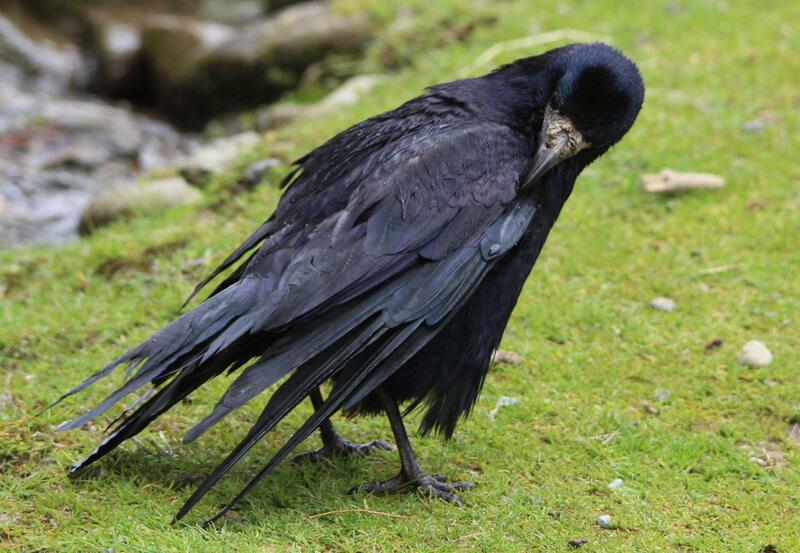 It is thought that many of the remaining rooks are males because the poisoning of nests targets the females, which do all the incubation of eggs. 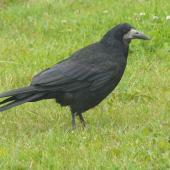 Rooks are listed as an Unwanted Organism in New Zealand, and are the focus of eradication campaigns by several regional councils. Before their numbers were reduced, they were a serious problem to germinating arable crops such as maize, sweet corn, cereals, pumpkins, peas (both at planting and maturing), and apples. 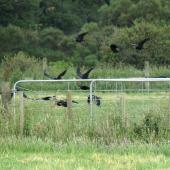 Rooks can also damage pasture by opening it up to thistles and other weeds while looking for grass grub. On the positive side they do remove a number of pest insects and break up stock dung looking for fly larvae. 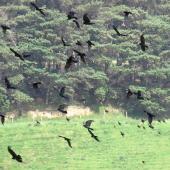 Rooks nest in colonies – the origin of the term ‘rookery’. The largest colony in New Zealand was nearly 1,000 nests but these massive groupings are a thing of the past. Colonies are usually in eucalyptus, pine or macrocarpa trees, and they have been recorded from Norfolk pines and acacia trees. The nests are built with twigs into a rough cup and lined with pine needles, eucalyptus bark, and tufts of grass, along with roots and sometime with pieces of wool. Egg-laying is from late August to late October. 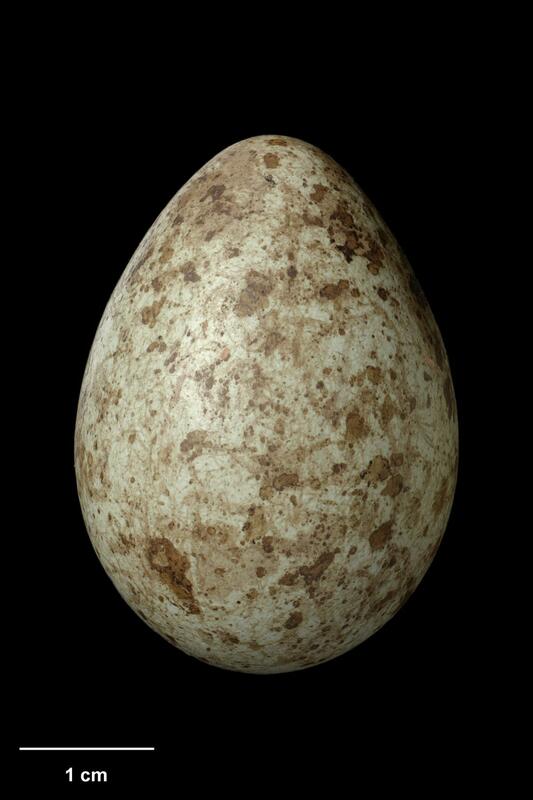 Clutches typically consist of 1-4 and sometimes as many as seven eggs. 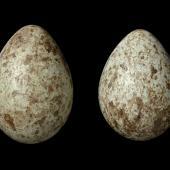 The eggs are pale greenish blue with brown splotches (39 x 28 mm, 16 g). 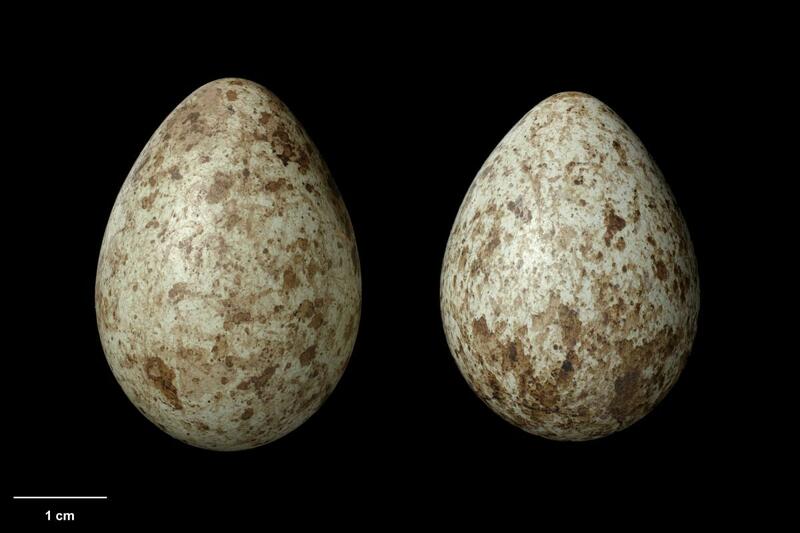 Females alone incubate the eggs (15-19 days) and broods the nestlings. The male feeds the female and nestlings, which fledge at between 26 and 38 days. Generally rooks start to breed at between 2-3 years of age. 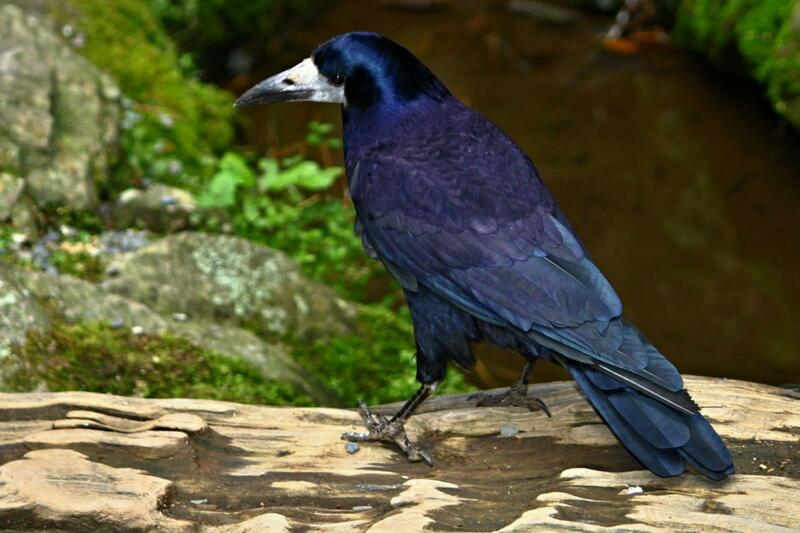 The longest living banded rook in Hawke’s Bay was about 15 years. 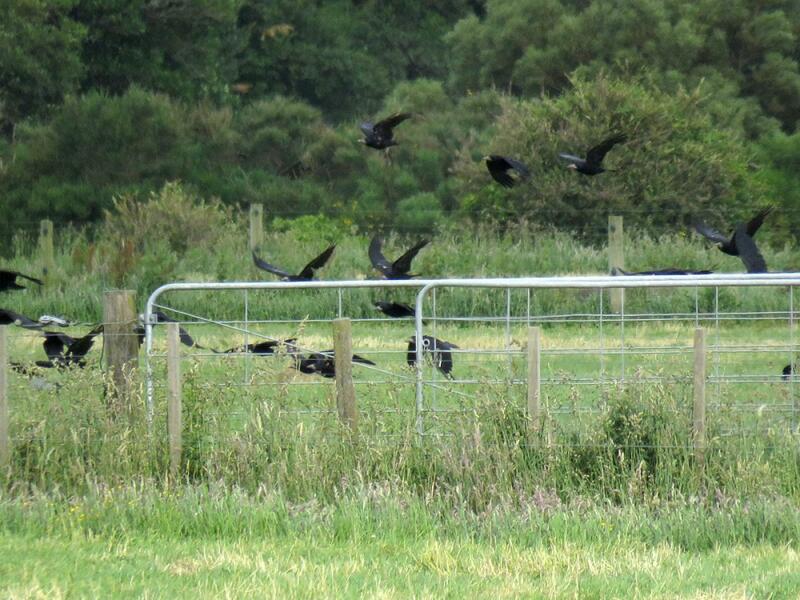 Rooks used to feed in gregarious flocks. 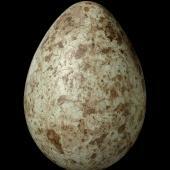 They would roost in large winter roosts containing birds from a number of breeding colonies. They would visit the breeding rookery first thing in the morning and again in the evening before returning to the roost site. Nowadays they are seen roosting only in small numbers. They usually travel up to 10 km from their night-time roost to feeding sites, while in the breeding season they forage within a few kilometres of the rookery. They are an extremely wary bird now and little is known of their habits. 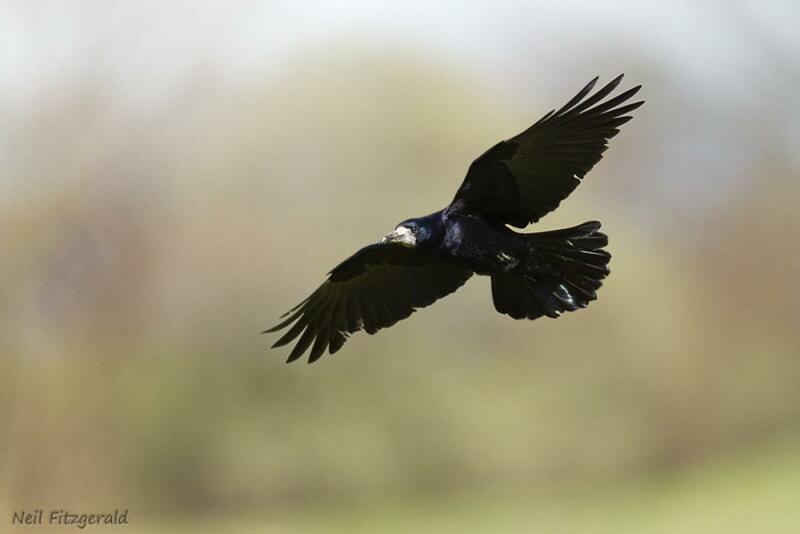 The main foods of rooks are invertebrates, especially fly larvae and adult beetles and larvae (grass grub) during warmer months. Walnuts and acorns are taken in autumn and winter. When these foods are scarce, cereals are taken mainly from stubble. Other important foods are carrion, earthworms, peas, grass and clover. 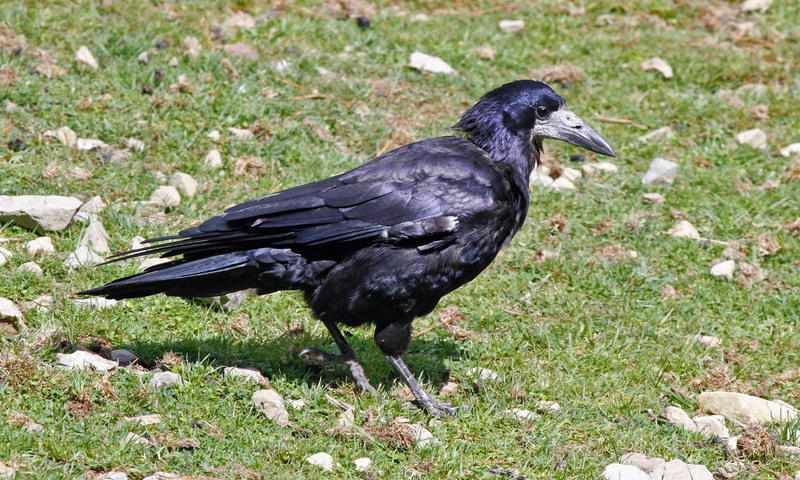 Foods fed to young rooks are similar to those eaten by adults except that the young are fed more striped dung fly larvae and a few blowfly larvae. Buddle, G.A. 1947. Note on birds of Mokohinau. New Zealand Bird Notes 2: 69-70. Coleman, J.D. 1972. 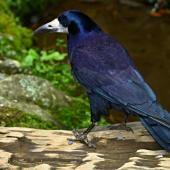 The breeding biology of the rook Corvus frugilegus in Canterbury New Zealand. Notornis 19: 118-139. Coombs, C.J.F. 1959. 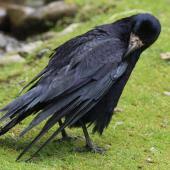 Observations of the rook Corvus frugilegus in southwest Cornwall. Ibis 102: 394-419. Falla, R.A.; Sibson, R.B. and Turbott, E.G. 1966. 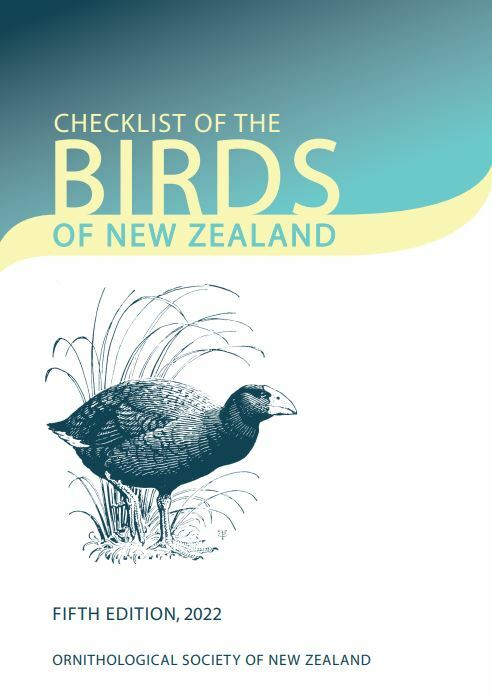 A field guide to the birds of New Zealand and outlying islands. Collins, London and Auckland. Nicolai, J.; Singer, D.; Wothe, K. 1993. Birds of Britain & Europe. Collins Nature Guides, HarperCollins Publishers. Ltd., London. Porter, R.E.R. 1979. Food of the rook (Corvus frugilegus) in Hawke’s Bay, New Zealand. New Zealand Journal of Zoology 6: 329-337. Porter, R.E.R. ; Clapperton, B.K. ; Coleman, J.D. 2008. 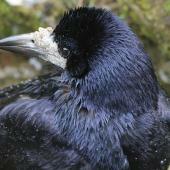 Distribution abundance and control of the rook (Corvus frugilegus) in Hawke’s Bay, New Zealand, 1969-2006. Journal of the Royal Society of New Zealand 38: 25-36. Purchas, T.P.G. 1979. 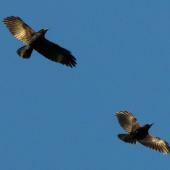 Breeding biology of rooks (Corvus frugilegus L.) in Hawke’s Bay, New Zealand. New Zealand Journal of Zoology 6: 321-327. Turbott, E.G. 1947. Birds of Little Barrier Island. New Zealand Bird Notes 2: 93-108. Untidy platform of twigs lined with small twigs and leaves. A large songbird that is almost entirely black with a purplish gloss, a bare-skinned light grey face, a long pointed black bill, and dark brown eyes. When walking on the ground they have the appearance of baggy-trouser like feathers on the upper leg. Rookery with one bird sitting and several others in flight.